There’s something about old abandoned train stations. Nostalgia and a whiff of former glory and buzz. A landmark, a meeting point, and the starting point of a journey. Some get a new life, like the tiny Oetrange station in Luxembourg. Walking up the creaky stairs, there’s a smell of creativity. 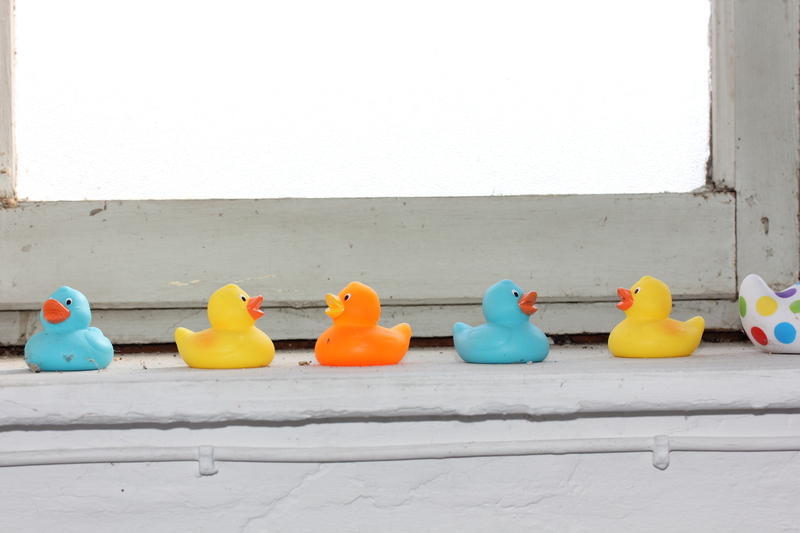 And if you can’t smell it, the rubber ducks sitting on the windowsill will set you straight. Waiting on top of the stairs are two women to whom this building means a lot, one peeking over the shoulder of the other in the narrow hallway. 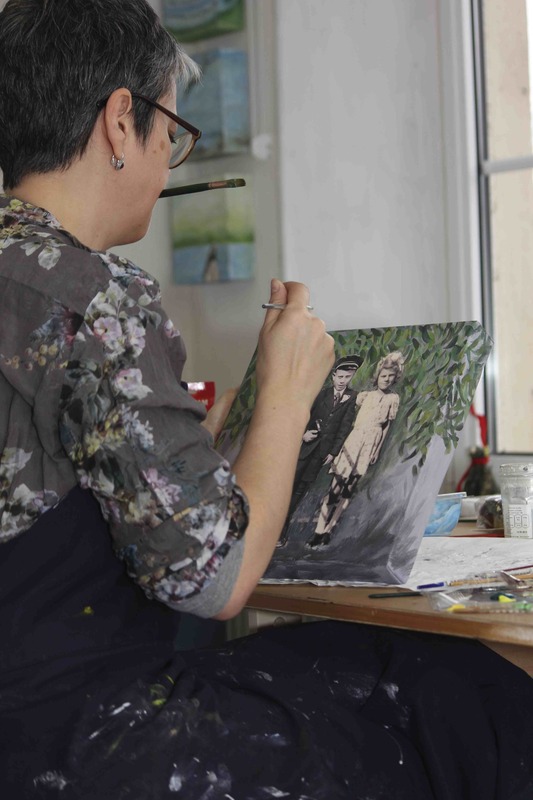 They are artists Diane Jodes from Luxembourg and Jeanette Bremin from Sweden – 2/3 of Semaphore Art Studio. 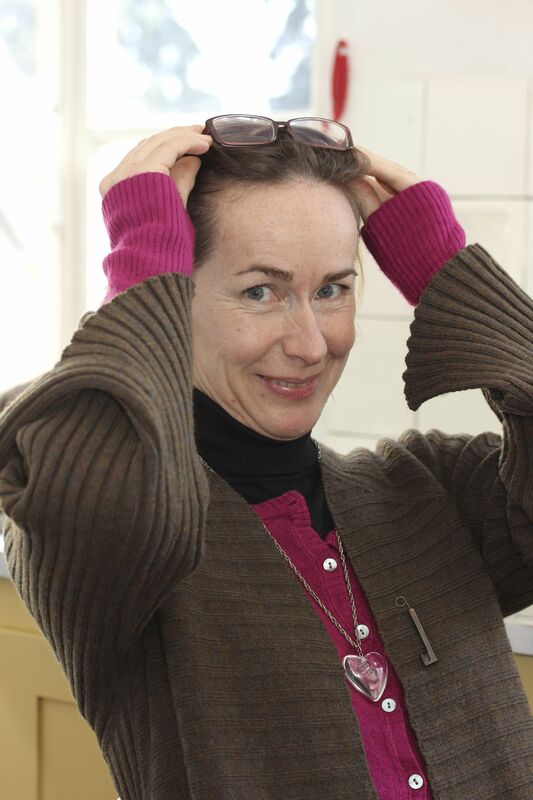 Jeanette came to Luxembourg in 1991, and soon felt like a spider in the European cultural net. Seventeen years and four children later, it was time to go do her art away from home. She set her sights on the Oetrange train station that had been out of use for years, a lovely yet worn down building. As it turned out, renting it wasn’t that easy. There were long discussions with the CFL (Chemins de Fer Luxembourgeois, the Luxembourg Railways), the real estate agent and others, but finally Jeanette was there, key in one hand, bucket and soap in the other. She needed a lot more than soap and water to get the place in order though, and different paintbrushes than the ones she had brought along. She wanted to give art classes to families of children with cancer, as a form of therapy. Jeanette knew better than anyone how much they need to get their minds off their situation for a while. She lost her five year old daughter to cancer in 1996. As a contribution to this project, a painting firm painted for free. The old Oetrange station was coming back to life. Before she became an “artiste professionel indépendent” receiving minimum wage, Jeanette rented the place out to various course activities to be able to pay the rent. 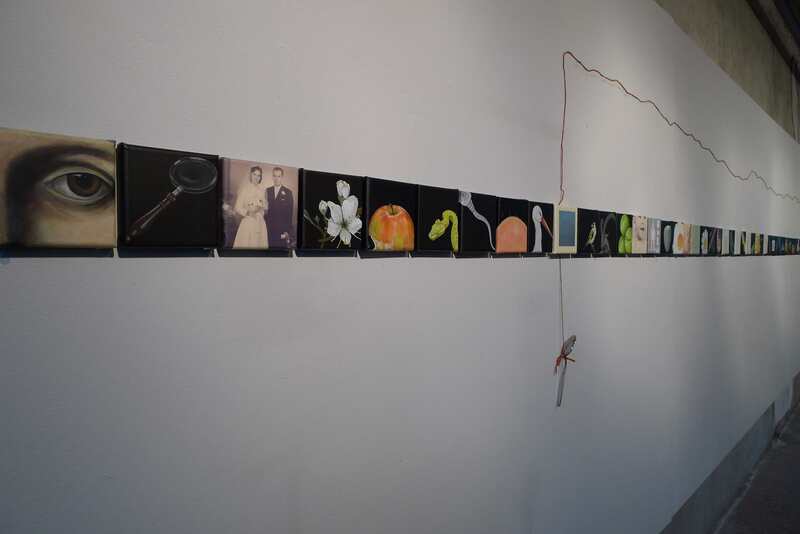 Then in 2010, Icelandic artist Gudrun Benedikta Eliasdottir joined her, and in 2011 Diane and Benedikta’s fellow countrywoman Thora Karlsdottir. The all-female Semaphore Art Studio was a fact. Semaphore: a system of sending messages by holding the arms or two flags or poles in certain positions according to an alphabetic code. The word is the same in many languages, it’s about messages or signals, and last but not least it’s a common railway signal still in use. Benedikta has since moved out and Thora is about to, but Jeanette and Diane have already found a new artist with whom to share the station rooms – and the passion and dedication to art – Robert Hall. Light floods into the kitchen, with the old red velvet sofa and Diane’s art on the walls, from her studio across the hall. There’s the sound of a train passing by and for a second you think you’re at the Whistle Stop Café having fried green tomatoes. Diane happily and modestly shows some of her works. There are miniature paintings from her latest exhibition, “Still Life – Still Line” in October 2012 in Esch-sur-Alzette, the result of more than two years work and a very personal journey. 366 miniatures, one for every day in a leap year, each one representing a piece of her life – old photos, drawings from when she was little… She takes out an old kindergarten book that her parents had kept. Diane and Jeanette start to reminisce about their childhood drawings. Diane thinks the exhibition had the same effect on the audience; they could reminisce and see themselves in some of her miniatures. Her hair salon was inspired to order 100 miniatures, so Diane is busy finding 100 relevant motifs – from old newspaper ads to walnuts, flowers and other ingredients to healthy and shiny hair. “We always put ourselves into what we do, and because we’re artists we can twist motifs and materials to suit us ” Jeanette adds. When she did an Irving Berlin exhibition in New York City, she made poetry out of song titles, put song titles on napkins, and matched it with portraits of Berlin interpreters. She gets the fun and the twist through combining various media: printmaking as the fil rouge, collage, painting, photography, sewing or even crocheting. Diane didn’t grow up in an artistic family, nor did she study art. Yet she’s always done it, first on the side – she’s a trained Montessori teacher – then gradually art took over. 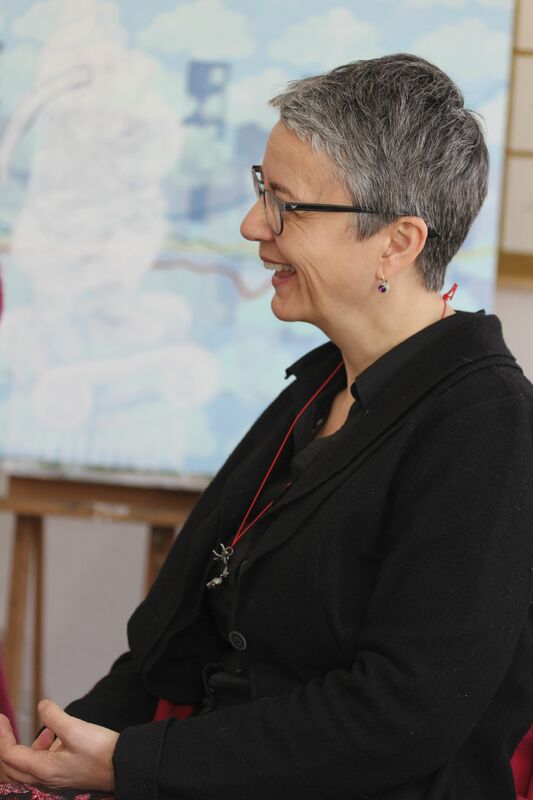 Later she took art classes, and she has co-founded art groups, among them the Empreinte Printmaking Studio, the only one of its kind in Luxembourg, which now has about 40 members. She was thrilled when she was allowed to make art using the old equipment of the printing and card museum Kulturhuef in Grevenmacher. “I seem to be into slaughter houses. Kulturhuef used to be one, and so did the Kulturfabrik where I had my last exhibition in Esch-sur-Alzette” she laughs. She makes handmade books to document her exhibitions, and she also makes books on http://www.blurb.com. One book, Ein Männlein steht im Walde – a photo diary, started as a Facebook experiment, posting one picture a day from her walks with her beloved bulldog Beaubête. The book not only shows how creative you can be with a camera, but also how nature is a source of inspiration. Diane needs to finish one thing before she can start the next, whereas Jeanette can get fed up and frustrated and move on to something totally different, working on several projects simultaneously. Let’s go downstairs to her studio to see what she’s working on now. And there it is, in the middle of the room, her big project. Big because it’s an elephant. Big because the elephant will take part in the Elephant Parade: She and her elephant friends will pop up where you least expect them in Luxembourg and Trier this summer. Big because the elephant is named after and dedicated to her daughter Desirée. She is covered with colourful butterflies. Jeanette would like to see Desirée in a field or a on a city street to make people stop and to let children climb on her. Before she started, she did a lot of research on butterflies. She always seeks information before she paints. That way her art is fantasy yet looks real. The 120 x 120 paintings lined up against the wall are from the 2012 travelling exhibition “Life”, also in honour of her daughter. She had been working on them since 2003. She paints on canvas and on fabrics, and there are paintings with a message, political or human. One is called “I accept”. 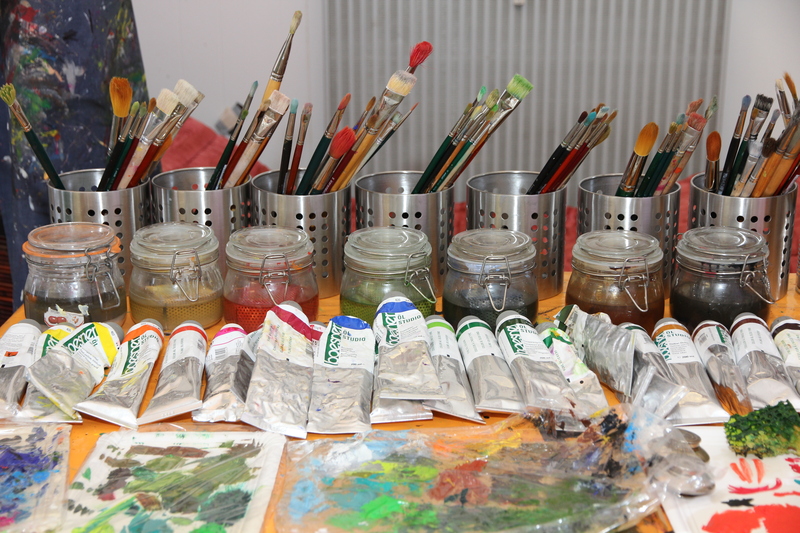 Diane’s upstairs studio is a charming mess, in Jeanette’s downstairs one the paints and brushes are arranged as if they were a still life in their own right. But there’s the same soft intensity and passion for what they’re doing. Together they have turned the old, abandoned Oetrange station into a beautiful place in more ways than one. It’s not necessarily as idyllic as it may seem. They are professionals, not “Sunday painters”, and money is a problem. 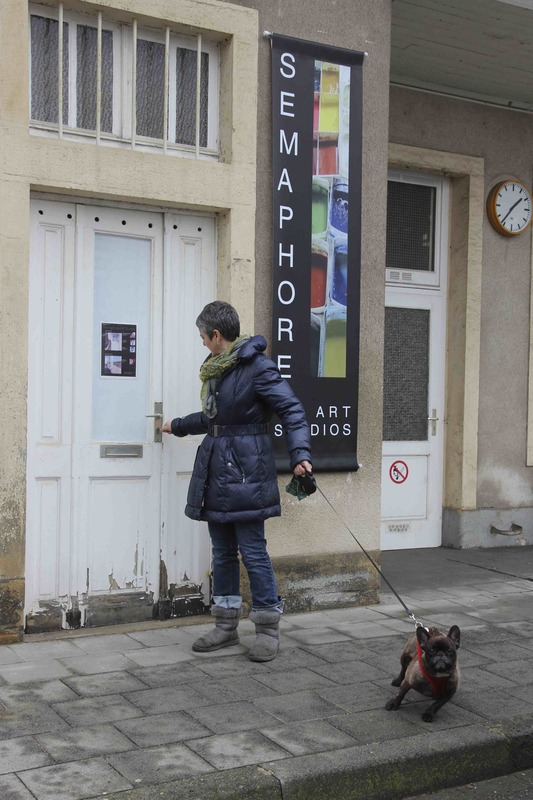 They both have several exhibitions to show for, in Luxembourg and abroad, but it’s still a struggle to maintain a name, have the right connections and knock on the right doors. A manager is for the few. “To make a living I give quite a lot of classes – printmaking, painting for adults and children…” Diane says. They have seen a change in the art scene since Luxembourg was cultural capital of Europe in 1995. It’s more open-minded, less conservative and less closed. Today, Luxembourg has a lot of art for its size, and a new generation of artists return from studies abroad. Yet they can’t see themselves doing a different job. They have both tried, but art is too important. « The Price of Fashion: How Much Is Too Much?